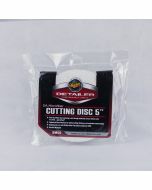 The Yellow Heavy Cutting Pad is designed to apply compounds or polishes to remove serve oxidation, swirls and scratches. The yellow pad is the most aggressive pad and should only be used on oxidized and older finishes. 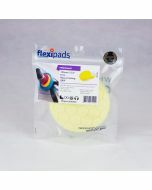 Always follow this pad with an orange pad and a fine polish then a white pad to refine the paint until it is smooth. 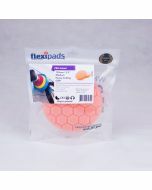 Developed to address weaknesses inherent in traditional foam pads, Hex-Logic technology is the first surface-functioning pad that adapts to curved, angled, sloped or flat surfaces delivering the maximum amount of contact and the right amount of product distribution to deliver perfect results to any surface. 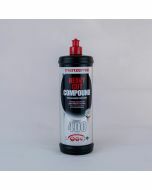 Based on hexagonal honeycomb-shaped product cells, the computer designed hex-logic system ensures proper surface contact and even product distribution over any surface. Durable Acu-Pore foam technology combined with hex-logic honeycomb product distribution cells enables hex-logic pads to utilize product, friction and heat to product prefect results on any surface. Hex-Logic foam pads perform slightly different from each other on the basis of how they are constructed. Under a microscope, Acu-Foam technology is visibly. 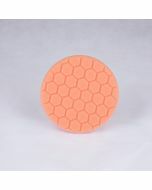 The foam pads also have a hex-logic honeycomb construction of small uniformly shaped cells. The smaller the cells, the more dense the construction. Each pad color has a different density of foam and a varying amount of cut. Once the foam style is selected the Hex-Logic computer carefully calculates pad density and adjusts the depth of cut into the pad surface. Each Color pad will have a specific depth of cut in reference to the hex-logic pattern on the pad surface. 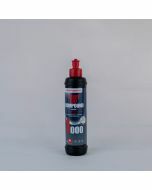 Hex-logic pads are open allowing maximum air to flow through the foam. 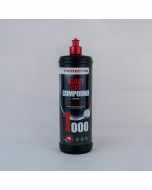 Chemical compounds and polishes require the right amount of air flow through the foam. Open cell foam is ideal is achieving the best results from your chemicals.